If you’re new to massage modalities, or maybe you just haven’t explored many techniques, you might be wondering just what Is Chinese Massage? Chinese medicine may differ from Western medicine in a number of ways. Traditionally, Chinese medicine practitioners might say that body energy must flow continuously to prevent stress and disease. Over time, they developed a range of bodywork therapies, such as acupuncture, acupressure, and Chinese massage to keep this flow of energy going. The techniques between the two differ, but both are said to help renew an individual’s strength and vigor after a 30-minute plus session. Though originating in China, Chinese massage has become widely used around the world, even in the USA. With Chinese massage, the “healer” manipulates the meridian system, which is made up of the inner energy points and pathways, encouraging the flow of “qi,” or body energy, and blood throughout the body. The tradition teaches that “qi” not only flows through our bodies, but it also animates the entire world. Practitioners work to balance their clients’ “qi” by clearing energy pathways of blockages that are believed to cause pain and disease. Chinese massage practitioners identify pathways with a limited flow, then use hand pressure to restore balance and energy circulation. A May 2013 study by the American Massage Therapy Association revealed that regular massage can treat many types of illnesses, including chronic low-back pain, cardiovascular problems, and rheumatoid arthritis. Traditional Chinese massage practice continues to grow in popularity in the West, including in the USA. Western clients who undergo traditional Chinese massage therapy can enjoy the mental and physical benefits, including stress relief and musculoskeletal realignment. Chinese massage therapists address and balance their clients’ entire holistic health, not just targeting and eliminating specific symptoms. There are many benefits you might reap from a Chinese massage. This type of massage therapy may help to provide relief from sore and/or injured muscles. Because this type of massage technique might be believed by some to help improve blood flow to affected areas, it may facilitate healing and relief by riding muscles of lactic acid buildup. In addition, Chinese massage may promote a calm and relaxed mood, helping the client to feel less tense and stressed. This might help both physically and psychologically. According to a 2012 study published in the Archives of Disease in Childhood, patients showed significant improvements in their physical conditions after the application of massage techniques. Therapists using these techniques might make their manipulations persistent and rhythmic, but at the same time soft. This is likely done in an attempt to achieve pressure effects that are deep, penetrating, and effective. Compression – Motions like pressing, nipping, stepping, and twisting apply direct pressure. For example, the movement of pressing back and forth with fingertips along the tendons is used to alleviate muscle spasm. This technique is usually used for relieving muscular stiffness, removing blockages, and promoting circulation. Swing – This technique includes finger-pushing, rolling, and kneading that stresses a coordinated action of the elbow, making the applied pressure act on the selected region for some time. Friction – This technique includes rubbing, gilding, pushing, and wiping to create heat on the body surface and enhance the circulation beneath. Gentle and rhythmic small circular movements are made with the palm or fingers over the skin. This technique is usually used for abdominal problems. Vibration – This technique involves rapidly vibrating, shaking, or rocking to create a constant force and remove stagnation, resume qi movement, release tension, and promote gastrointestinal functioning. This technique is usually applied to the head and chest regions to relax athletes or relieve problems like insomnia, amnesia, or bowel disorders. Percussion – This technique involves clapping, striking, tapping, or knocking the body surface with hands or tools. It is usually used to ease muscular pain, numbness, spasm, and headache. Different types of strikes are used over the body. For example, fist striking is used on the back while palm patting is used on the crown of the head, waist, hip, and limbs. Pinching and Grasping – This technique includes the rhythmic picking up and squeezing of the soft tissues while holding, twisting, kneading, or pinching with fingers. The techniques are usually applied to regions that anchor ligaments and tendons, such as grasping the shoulder to resume the flow of qiin the chest. Joint Manipulation – This technique includes rotating, pulling, abducing, and adducting actions along the axis of particular body parts to increase the range of joint motion and promote flexibility of the limbs and spine. The above is an overview of the common techniques that might be used in Chinese massage. Specific force, frequency, moving direction, and duration will vary depending on the client’s needs and the practitioner’s massage plan. A proficient massage therapist must undergo extensive training and practice to master a variety of massage techniques. At Fremont College, you can train to become an effective and skilled massage therapist in as little as nine months. Our Massage Therapy program offers students a variety of opportunities to practice a variety of massage techniques in the real world by attending sporting events throughout Southern California. Our extensive training program helps students obtain the required practice hours to apply for Massage Therapy Certification and start their career in this rewarding field. For more information, speak with one of our knowledgeable mentors today. *In no way is it recommended that you try to treat injuries by yourself. That should be done by a qualified professional. Before practicing any new modalities or techniques, check with your state’s regulatory authority to ensure they are within the state’s defined scope and standards of practice for therapy. 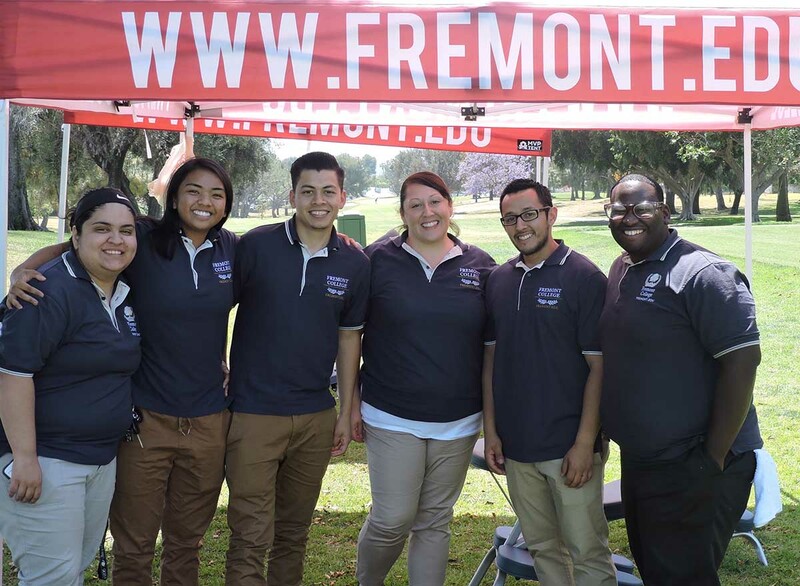 In no way does Fremont College promise or guarantee employment or level of income/wages.